The Marathon Diaries: "Hold Your Pace, Girl!" The Marathon Diaries: Hold Your Pace! Per Sid's instructions, I ran three times this week, each time focusing on different things. On Tuesday, I ran on the treadmill, going on a 10-minute gradual climb on a 10-gradient, recovering for three minutes, and then repeating for a total of 45 minutes. 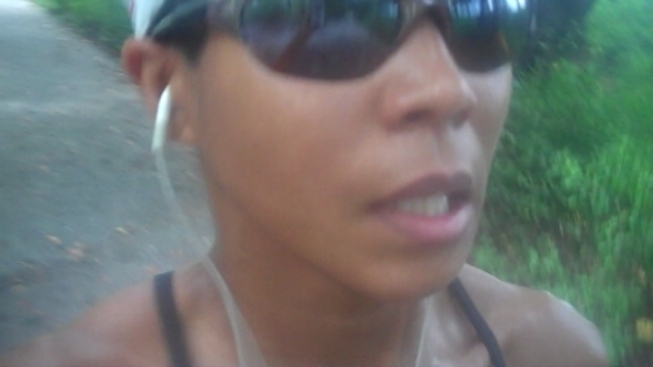 I threw in a couple of speed-work intervals in there, too -- ugh! Pretty brutal. I was totally exhausted that night and felt it the next morning. The next day I did some indoor cycling and took it easy. Thursday, the plan was to do some tempo work with Sid on the bridle path. Because of all of the crazy Noah's Ark weather we were having, that was a bust. There were too many issues -- mud, rain, tree branches -- and we had to move the workout inside. Sid kept telling me to run at an 8-minute-per-mile pace for 45 minutes on the treadmill. "You've got to hold your pace, girl; hold your pace," said Sid. Well, I did hold my pace at 8 minutes, for an hour -- overachieved! -- and there were a couple of times I wanted to crank that thing up because it felt a little slow and I was BORED. There’s nothing like running in place staring at a wall for an hour, going absolutely nowhere. In that hour, I started to have devilish, counterproductive thoughts. “Is this a metaphor for my life, feverishly running but going nowhere?” I wondered. Sigh. Thankfully, just when I was pushed to the brink of boredom, it ended. Whew. When I reported back to Sid that night, I told him how I held my “pace, pace, pace,” even though I wanted to go faster. I figured I should follow his instructions and not get caught in the trick bag of thinking I could go faster. There were 26.2 of these miles I had to do. Speaking of long -- I had my scheduled long run Saturday. I was supposed to do 16 to 18 miles, which seemed, well, long. Sleep was a little better this week but not much. In preparation the night before, I skipped my Friday night Zumba class; my Spidey sense told me doing a bunch of booty pops and spastic jumping the night before an 18-mile run was probably not the best Jennifer idea. Cut to: Waking up at 2 a.m., television blaring, my dog staring at me, every light in the apartment on. Not good. I stumbled to bed, where I couldn’t fall asleep for another hour. Needless to say I woke up late the next morning, completely unprepared and running around like a chicken with my head cut off. I was late getting to the park but stayed the course and did my long run according to Sid’s instructions. He totally busted me when I passed him on the first loop. “You’re late girl, you’re late," Sid said. "Keep going, hold your pace." And I did. The first few miles are always a little tough for me. My body’s like, “What? What are you doing, Jennifer, because I’m still asleep." Then a few miles into it, I catch on. By the sixth mile, I’m like, "Okay, I'm awake," and start to feel good. I love running in Central Park but I gotta say for the long runs it can get a little boring: looping the same tree, the same bench, over and over and over again. I did three outer loops on the bridle path for 18 miles, plus the run to the park from my gym and back. So in total, about 21 miles. Each time I looped Sid and Asteria (they’re both watching now! ), so I had to keep it together and push through. Asteria: “Open up your stride!" Wonder twin powers activate! OMG. On that last loop, I’m not going to lie, I was totally over it, thanks to a combination of fatigue and boredom. Luckily, I ran into my friend Yuki who was on her long run. She looked great and that carried me through. I was tired when I finished but felt good! I stretched, did cold plunge (my frenemy) for 15 minutes, then got a massage. The next day, my legs were a little sore but overall felt recovered. Sid checked in with feedback. He said I looked good, held my pace, and looked as strong in the end as the beginning. I was still making too much noise with my feet, though. We’re seven weeks out. This week, we work on speed. Good times, good times.